Thought I would throw my hat in the ring. According to my husband I am not much of a romantic, so I apologize in advance. I thought I was in love with my first wife, Becky. She was simple and easy to please. A humble bunch of handpicked flowers would bring her great delight. I remember she would hum and giggle as she arranged them precisely in a big blue vase. It was easy to keep that doe eyed blonde smitten. So tediously easy that the monotony became unbearable. So one evening I walked the neighborhood in search of something special. She almost cried when I presented her with a small bouquet of delicate white flowers, but it was the Oleander infused tea that truly took her breathe away. Marge, my second wife, was a little harder to please. Flowers quickly lost their currency. I had to find something bigger, better, and in Marge’s case, shinier to woo that raven haired beauty. I would present her with necklaces of gold and silver, embellished with diamonds and other sparkly gems. Marge lusted after all that glitters, but she was never satisfied. All to quickly she would covet more. The debt mounted, my hair grayed, and she offered little in return. So I brought her one last gem, a cushion cut ruby ring the size of a ping pong ball. When Marge saw it she was at a loss for words, even more so when the beast of a gemstone came loose and lodged in the back of her throat. I am now an old man making one last attempt at this love game. Tilly was unlike the others. She cared little for flowers or jewels. All she wanted was my time, or what was left of it. So here I am, on a beach in the middle of winter with the chilling sea breeze beating against my skin. My hands tremble as I move the stick through the sand, slowly marking out the shape of a heart. This will be my last great romantic gesture, only this time I don’t want to make my girl speechless. 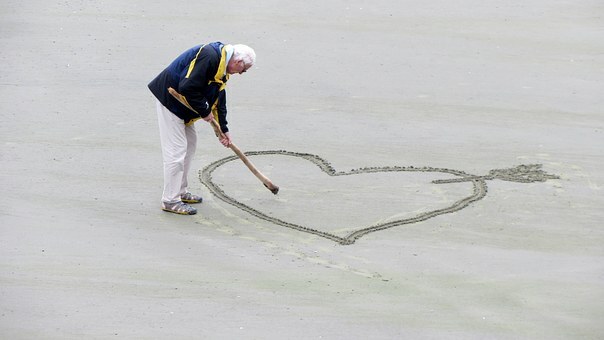 Scott always drew that heart on the beach every morning with a branch. He was old, a book store owner. Eyes sad, smile kind. Of course, he’d lost his wife some years before. Sean always watched Scott draw that heart. Eighteen years old, considering whether to drop out of school. Eyes cold, rare smile. Experiencing his first love, which was dying out by this time. Sean had wanted to ask Scott why he did that. And that morning, he’d been compelled to. “Why do you do that?” asked Sean. Scott chuckled. He threw the branch to the sea and walked away. Sean followed him. They arrived at a small restaurant near the beach, where Scott sat down. A waiter brought him coffee immediately. Sean stayed back. “Same as always?” asked the waiter. “I really want to know why you do that,” said Sean approaching. Done with breakfast, they walked back to the beach. The tide had swelled, already licking at the tip of the heart. Sean smiled. He understood why his first love was dying out now. I talk to my wife all the time. It makes the days less lonely. Alva, you’ve won the contest! Send me an email through the contact me box and let me know where to send the $5 gift card. Next Post: Author Interview – Laurie Breton!